This article is about the village in Tana, Norway. 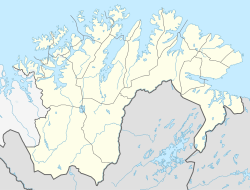 For the former municipality in Finnmark, Norway, see Polmak (municipality). 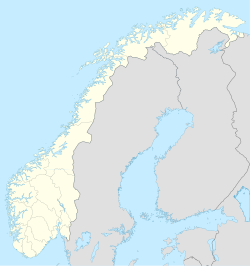 Polmak (Northern Sami: Buolbmát and Finnish: Pulmanki) is a village in Tana Municipality in Finnmark county in Norway. The village is located on the south shore of the river Tana, just east of the border with Finland (and the northernmost point of Finland). The village is the site of the Polmak Church. The village was the administrative centre of the old municipality of Polmak which existed from 1903 until its dissolution in 1964. The name is a Norwegian version of the Northern Sami form of the name, Buolbmát. The meaning is unknown. ^ "Polmak, Tana (Finnmark)". yr.no. Retrieved 2018-05-12. ^ Askheim, Svein, ed. (2015-12-09). "Polmak". Store norske leksikon (in Norwegian). Kunnskapsforlaget. Retrieved 2018-05-12. This page was last edited on 13 May 2018, at 02:21 (UTC).